I met up with a mate I've seen little of over the last year in Central Cambridge then headed out to the Magnum gig. So chilly was it that there was a huge snowman facing the venue. Inside the crowd was sparse (we arrived about quarter of an hour after doors opened) until a little before than band came on when the bar area obviously joined us in the hall. 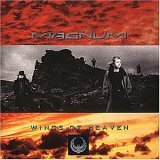 No support tonight as Magnum were doing two sets; one of tracks from various albums; the second featuring a 20th anniversary (well, it will be next year when the live album recorded on this tour is released...) live rendition of Wings Of Heaven. I have the record store promo display for this album in Elgin - I was working in Virgin in Edinburgh at the time. Pity I didn't take it down last time I was up and an autographed copy may be worth a fortune on eBay. Or not?. Tonight we got the whole album that, if memory serves, is more than was played on the tour in 1988. Mind you, the halls are smaller now, but that didn't prevent the band giving the show all their energy. Having watched the Heaven and Hell (Black Sabbath with Dio) DVD the other night it was nice to hear that Bob Catley has kept his voice better than Ronnie James Dio. An so to the show. Paddy was unsure how many songs he would recognise but second out of the hat was Backstreet Kid followed by How Far Jerusalem - both of which brought his first Magnum show back to him. In fact it seems we both saw Magnum on the same tour, at different ends of the country, in December 1985. Three tracks from the latest album were played but they suffered among the old classics by being a touch too similar tempo and ploddy. That is true of much of the Princess Alice and the Broken Arrow album and what prevents it being a true classic Magnum album to my ears. Most of the remainder of the first set was split evenly between the Storytellers Night and Vigilante albums with the sole early classic Kingdom of Madness to round off the first hour. A twenty minute break allowed for band and punter alike to have a pee and get another drink in before the main event. The Wings Of Heaven album was played through in its entirety as per the original release. The tracks that fared least well were the ones not played on the original tour but that didn't make them awful by any means. They are just the standard quality tracks that fill a good album but stand a level down from the better tracks that make a great album. The Epic Don't Wake the Lion brought that set to an end before a short encore break which we were lucky to get considering the apathy of the crowd. Back came the band for the only other early Mangum classic, Sacred Hour. Then it was time for the band introduction as they took their bows and then off they trotted and Paddy was left wanting more. Well, wanting Just Like an Arrow which he'd been singing since I met him earlier in the evening. Had the crowd been a bit more up for it maybe he would have had his wish. I can't see much of the show making the live album release based on audience feedback. Actually, during the show they were pretty good at singing along etc, they just didn't seem very animated when it came to encore time. I was asked to stop taking photos about three songs in which, as usual, took the edge off for me a bit. I decided not to let it spoil the evening though and enjoyed the rest of the show. At the break we moved more centrally and I was more careful with the camera for the second half and got away with it. The verdict - one of the best Magnum shows I've seen since the early 1990s. 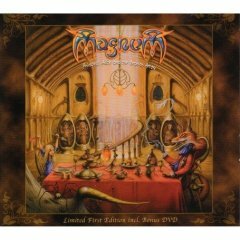 Not maybe as good as the Storytellers 20th anniversary show (which I would have bought on DVD tonight if they'd had it for sale) but then that was overall a slightly stronger album than Wings Of Heaven. I would go to see them again on Saturday in London except I think I'm booked for Twelfth Night at the Peel in Kingston. Here are a selection of photos from the show.